I know, I know. We’ve been so very remiss in this area lately – but there’s a reason! I was out in BC at Jay’s place over the March Break working on games. We wanted to ensure we had some new things to show at “The Gathering of Friends” in April – a gaming community event hosted by the prolific Alan R. Moon (he of Ticket to Ride fame). We worked so hard, that we totally forgot about adding to the blog! We also got to work on our secret hush hush project for WizKids – a project so mired in secrecy that to say the title would result in an implosion of the interwebs! We also came up with several other concepts yet to be fleshed out (including a thought of doing a dice game in the world of Belfort, a spy game, and), playtested the 2nd iteration of the upcoming Belfort expansion, and ran some blind playtests for games from other members of the Game Artisans of Canada (Paul Saxberg’s Coven, Michael Xuereb’s Orc Tribes, and Al Leduc’s A Game of Cat and Mouse). Jay and I were also 2 of the only people in the world to watch John Carter (good movie, despite the poor box office showing) and we got to laugh our asses off at 37..no…that’s not right…21 Jump Street. I don’t get to go to movies often, so it’s a treat that only happens when Jay and I are in the same town. So a lot of work, a lot of fun, and, thus, not a lot of blog posts! That should change from here on out. Well, until the next game designing binge! Well we’re elbow deep in Belfort Expansion awesomeness! We’ve completed Phase 1 of our playtesting and are now just getting into Phase 2, with the first playtest report coming back already (thanks Daniel!). We knew that this expansion needed a lot of playtesting since it added some new dynamic content – so we enlisted the help of our fans – and our fans responded en masse! We had to stop accepting playtesters when we reached 70! We have 70 groups of gamers all over the world – from Singapore to Australia to all over North America – testing our expansion to ensure it’s as balanced as possible. We had a lot of great input from all the playtest reports from Phase 1. We read each one, and looked at them all as a whole – which helped us identify what needed more focus or tweaking. Then we released Phase 2, but we threw everyone a curve ball by adding a completely new aspect to Phase 2! We were excited about Phase 1 and how it would change how you played, but what we’re trying to do with Phase 2 has us positively giddy! We can’t wait to show the rest of the world! And there will be even more surprises – so those of you who are playtesting Phase 2 still won’t know everything…! So a big thanks goes out to everyone who signed up to playtest the expansion! We hope to have as many session reports in within the next 2 weeks so we can make the final tweaks and send it off to get some lovely art done by Josh Cappel! Notice on the Calendar that it’s divided into 3 seasons? Wouldn’t it be great if there was another way to score points in Belfort? Belfort combines 3 core gaming mechanics (area majority, worker placement, resource management) – could we add another core mechanic? If you don’t self-publish then you often don’t get much of a say in the art for your game. Remember, it’s the publisher taking the risk in publishing it so it’s fully within their rights to make all decisions on the art. That said, if you have a good relationship with the publisher then you still have a voice during this stage. Once we submitted the game to be published, then it’s the publisher’s job to seek out an artist. It is possible to recommend an artist of course. I know that Matt Tolman really wanted Gavan Brown to do the art for his game, Undermining, for example, and that is actually what happened! 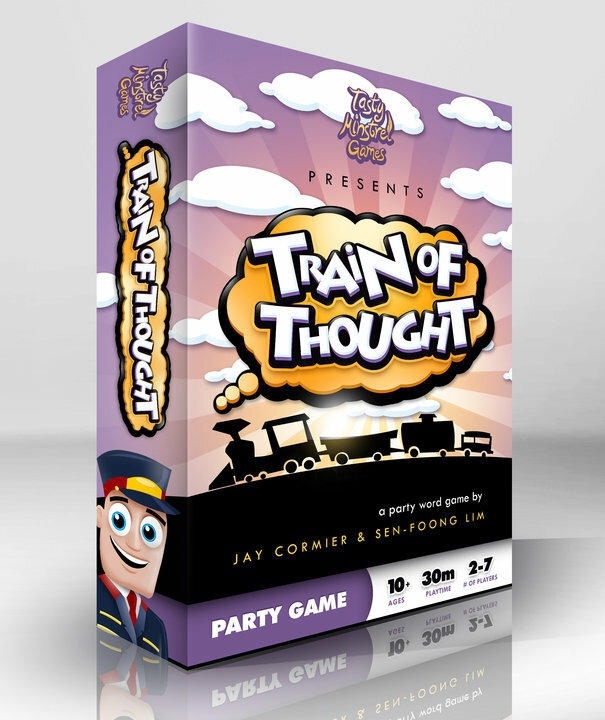 For Train of Thought, Tasty Minstrel Games also chose Mr. Gavan Brown! Our first exposure to his art was when we were shown the box art. Immediately we both loved it. 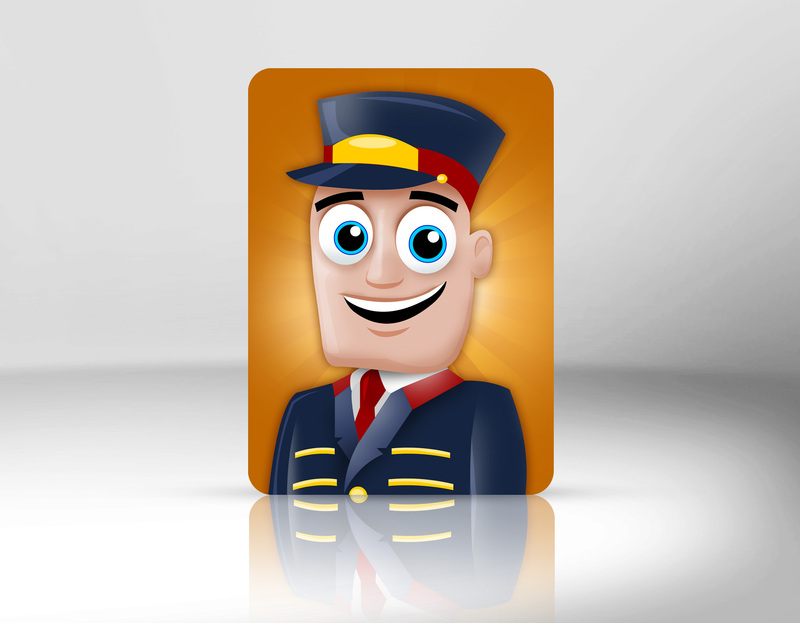 At the time, the train had the dragon from the Tasty Minstrel logo as a conductor riding the train. It was the only thing that wasn’t perfect and even though we had no ‘right’ to asking for art changes, we expressed our opinion. Fortunately Tasty Minstrel felt similarly and we all agreed to tweak it a bit. We were fortunate to work with a publisher that allowed us to express our thoughts on the art. Well, we say fortunate, but we’re not really sure what it’s like working with other publishers…yet! The rulebook was another story altogether. Sen and I wrote the rules a long time ago and when Gavan took our words and put them into his art style – there was a clash. Our words were too stuffy and lawyer-y compared to the fun style that Gavan brought to the game. We did a quick re-write and that got incorporated into the rules as well. Belfort was even more of a collaboration between us and the artist. When we first heard that Josh Cappel was doing the art, we were ecstatic! I remember buying the game Endeavor because of the awesome art that game has. Tasty Minstrel set up a page on Basecamp so we could see Josh’s art as he made it, and so we could all comment on it. 90% of time we were over the moon with what Josh Cappel provided for the art. There were a few examples where we requested some changes. Sometimes the publisher agreed with us and sometimes they didn’t. For example, there was one issue with the guilds on the board. Initially they didn’t have a spot for worker placement, which was fine as it was going to be on the Guild card, but when the art for the Guild cards came out, they too didn’t have a spot for a worker to be placed. Once this was brought up, Josh found a solution that made everyone happy. He re-jigged the board art so that there was room for a worker placement spot. This is the main reason why it’s great when the designer has input on the art process. I can see why a publisher wouldn’t want to give veto rights to a designer – but at least allow them input as they are (hopefully) the people who’ve played the game the most and would catch things that don’t fit with the game. The only time I had an issue with the art was the back of the box. Josh put a lot of humour in Belfort and so he had a very funny letter covering most of the back of the box. It was really fun, but my opinion about the back of board game boxes is that it should show as many pieces of the board game as possible. Fortunately everyone was in agreement and new art was made and it was perfect! Now it’s the most perfect-est box back ever! We were lucky to be paired up with not only excellent artists so far, but with artists that are very collaborative. May you be so lucky in your game designs! The take away for us on this is that you should try to ensure you are allowed some sort of input on the art process. While this probably won’t be put in the contract (but maybe it should be somehow), hopefully you’ll be working with a publisher that wants to collaborate with you as much as possible. Also, you shouldn’t be afraid to express your concerns, though you need to know which battles are worth fighting. We might have had other issues here or there (though I don’t think we did! ), but only really expressed our concern if we thought it would impact the game play or the game’s sell-ability. To me, this was probably the most exciting stage of the whole process of bringing a game to market. While its fun to work on the initial design and it’s awesome to finally get the finished product in hand, there’s something about watching a skilled artist take something that’s just a dream in your head or some chicken scratching on paper and make it 200 times better than you could even imagine! Gavan had the difficult task of working with a party game that was really just words. Oh, our original prototype had train car on the backs of the cards that you could connect to see who made the longest train, but that was about it for real graphics. What Gavan did with the game, however, was give it a “face”. He created the conductor from scratch, giving the game a human mascot – a talking head – that we could use for expository purposes. Gavan also implemented a ton of design elements on the box that make it that much more effective packaging using elements that Jay and I would never have thought of – things like the ISBN number and the vertical spine – to make it shelf-friendly in a potential mass-market situation. Josh had the potentially staggering task of creating what amounts to a whole game world from scratch. And not one that he had dreamed up, but one that two other dudes had knocking around in their noggins! Belfort gets many compliments on the great artwork Josh provided and if there was an award for best game artwork, Belfort would be a strong contender – the in-game humour, references to other games, and hidden gems are just a few of the reasons why the Belfort artwork is tops in my (biased) book. 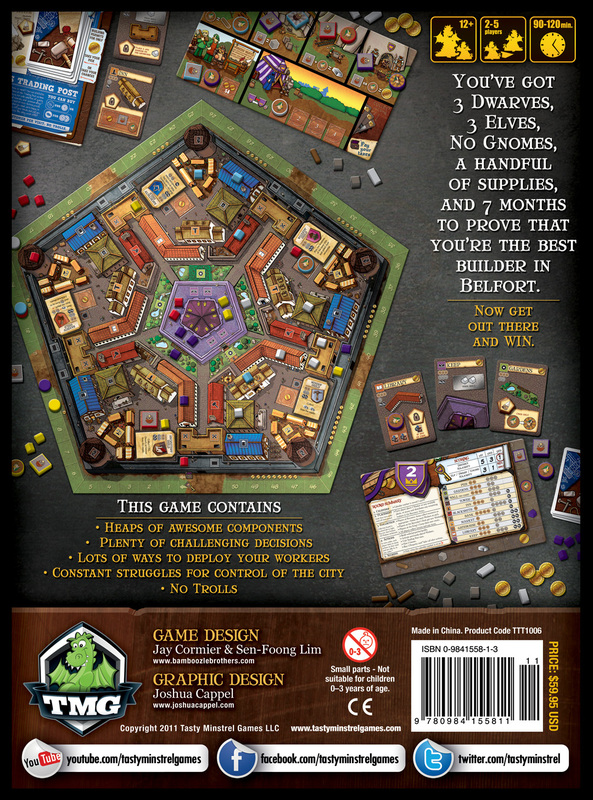 Speaking of books, if there was an award for best game rulebook, I would also humbly submit that Belfort might be *the* best game rulebook this year. 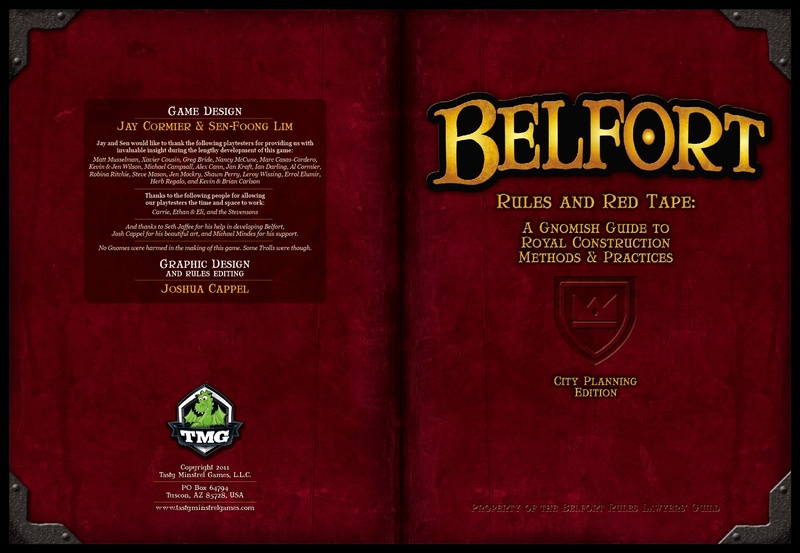 And a huge part of the credit for the layout, flow, and humour inherent in the Belfort rules comes from Josh. He took our ruleset and reformatted and rephrased things in a way that better suited the witty, anachronistic fantasy world that he had drawn for Belfort and it all took shape from there. The synergy generated between us (the designers), the developer and publisher, and the artists we’ve worked with on our games has been nothing short of eye-opening and pudding-eaten proof that a well thought out product and a game that is literally *designed* for maximum impact in all aspects can deliver much more than the sum of it’s parts. I look forward to working with Josh and/or Gavan again and would recommend them without question to any publisher looking for more than just an illustrator, but a game-specific graphic designer who can not only draw and design, but oversee other artists when more content is needed (see Gavan’s work on Eminent Domain for an example of this).